Chi Ni has the distinction of being ensconced in one of the prettiest properties in the city. If you are looking for a city staycation, the Dusit Devarana has to be your number one choice, given its location (not too far from Gurgaon or Delhi) and the fact that once you step in it is so easy to forget this is a city hotel. While Chi Ni, their Chinese restaurant, has always been a crowd puller for dinner, its new set lunch menu is a move to draw in the corporate crowd in from around Cyber City. Meeting a high profile client for lunch? You can't go wrong if you opt for the set lunch menu at Chi Ni. You have a choice of soup, plated appetisers, a main (with rice or noodles) and a dessert. We began with the soups and decided to try two options listed on the menu between me and my lunch date. I opt for the hot and sour chicken while she chooses the more safe option of chicken sweet corn. Both are really delicious and fresh, without any of the cloying sensations you typically experience with soups that tend to go gluggy (too much corn starch). The true star of the set menu though is the platter of appetisers. Almost a meal in itself, you are spoiled for choice as they serve you an elegant diced chicken lettuce wrap which sings of summer and is light and easy to eat. To offset this, the wasabi prawns are creamy and rich, so eat them second, giving your palate ample time to enjoy the remaining flavours on the plate. The blanched spinach sounds deceptively simple and boring on the menu but the deep green confection slathered generously with a sesame-miso dressing is oozing goodness. The only miss on the platter for me was the crispy spicy mushroom which was like a ball of fried batter, the mushroom lost somewhere. By this time you are reasonably full, but given that everything on the menu is so good, you must give the mains a go. 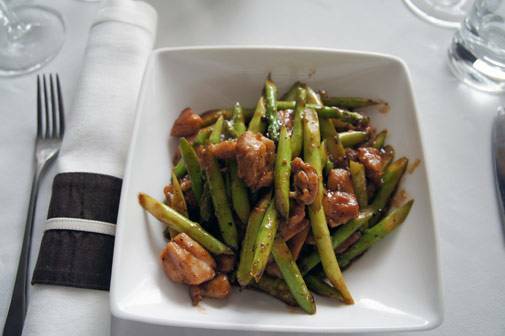 The wok fried chicken with asparagus is really generous with the greens which really work well to cut the flavours of the poultry. Best eaten with a portion of the lightly flavoured ginger rice. The Schezuan steamed Indian sea bass is light but can tend to smell a bit fishy, so steer clear if you like a non-fishy fish. There are options for vegetarians as well, so don't despair. End your meal with the signature splendid yogurt which I remain undecided about. While I loved the creamy texture of the baked yogurt, the compote that covers it tastes synthetic and takes away from the goodness of what lies beneath. The senses of chocolate might be a better bet if you like something stronger to end your meal with. Overall, the experience at Chi Ni is flawless. The service is attentive, the music is understated and this is clearly one of the best fine dine Chinese options in the vicinity. Hop over the next time you have a client or boss to please and you won't be disappointed.